The common Hellebore (Helleborus) are in themselves a useful garden plant, but once we start to look at the wonderful H. Orientalis hybrids available for sale in Australia the world of helleborus x hybridus collecting begins to open up. 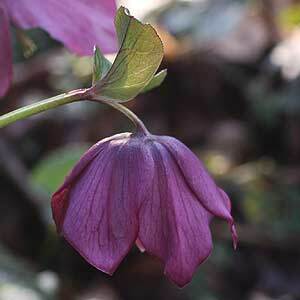 Flower forms also differ, did you know that you can buy double hellebores, and Picottee flower forms. White flowers spotted with pink, pink flowers spotted with red the list of varieties offered for sale online is almost endless. Any flowers in Winter are welcome of course, and when July has turned to August we have hellebores as well as wattles, Epacris (native heath) in pink and white; yellow, perfumed Mahonia and camellias to enrich our gardens. 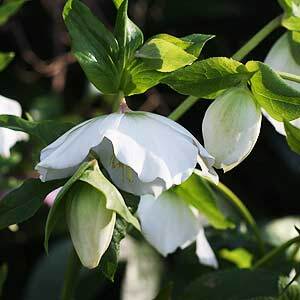 They can be used in shaded positions and work well beneath deciduous trees where they can be planted with purple, white or yellow Crocus while glistening white snowdrops (Galanthus) complete the picture. Hellebore specimen plants can grow well in pots and with a little cutting back of old foliage during winter they are easy to maintain. 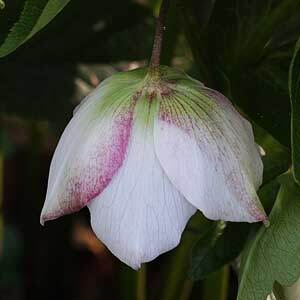 Hellebores have dangling cup-shaped flowers which invite one to reach down and look inside. The outside of the sepals (which look like petals: the true petals are reduced to nectaries within the flower) may be rich pink while the inside may be paler, sometimes spotted, within. Dark nectaries can make the flower even more fascinating. Height – To 50 cm. Spread – Clump forming to 70 cm. Flower colour – White through to yellows, pinks, reds and deep slate grey. Flowering period – Mid winter inter through to spring. Growth rate – Fast once established. Water requirements – Low once established. Pruning – Prune back in early winter to tidy up and for the best flower display. Fertiliser – Use a slow release, general purpose fertiliser in spring. Mulch and organic fertiliser is also suitable. These new colorful flowering hellebores brighten the winter months and with the ability to grow in shade to part shade, hellebores are a wonderful versatile plant. The pink, plum and white varieties are known as Helleborus x hybridus and incorrectly as Oriental varieties because there are genes from H. torquatus and others in the parentage of these varieties, not just H. orientalis which is greenish-white in the wild. H. x hybridus vary from green, white, pink to purple and plum-black. Yellow ones are occasionally available and grey-blue and spotted ones are irresistible. Old varieties may have green through the flower. Hellebores are a native to areas of Europe and were believed to have medicinal attributes they all prefer a humus rich well drained soil. 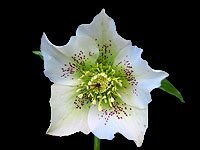 Species available for sale in Australia include : Helleborus x Hybridus, H. Orientalis, Double Hellebores, H. Corsicus, H. Viridis, H. Foetidus, H. Argutifolis, White Helleborus, H. Odorus. Hellebores can also be grown from seed. PO Box 744, Woodend, Victoria, 3442. Specialist Hellebore nursery in the Macedon Ranges. Quality hand pollinated Helleborus x hybridus & good range of less common species. "Mail order Hellebores available May to August. Hellebore Sale days in July and August"